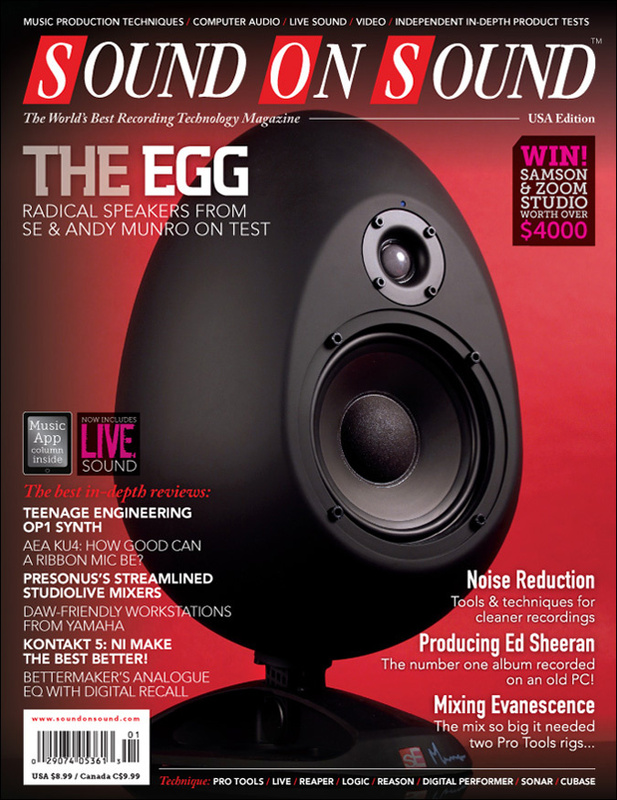 Reviews: SE Electronics Munro Egg 150 (Cover), Yamaha MOX6, Acustica Nebula Pro 3.5, NI Kontakt 5, PreSonus StudioLive 16.0.2, AEA KU4, Bettermaker EQ230P, Coleman Audio QS8, JZ Microphones Vintage 11, Teenage Engineering OP1. Techniques: Noise Reduction Tools & Techniques, Jake Gosling: Producing Ed Sheeran's +, Mandy Parnell: Mastering Björk's Biophilia, Inside Track: Evanenscence's 'What You Want', Classic Tracks: Petula Clark 'Downtown'. This lovely mic from AEA is based on a classic RCA design from the ‘40s. It certainly looks the part, but is it worth the asking price? Mike Watkinson takes a look at the IK Multimedia iRig MIDI interface for iOS whilst JG Harding examines the Fostex HPP1 portable DAC & headphone amplifier for iOS. The latest addition to Arturia’s Analog Experience series takes their hybrid software/hardware synth concept even further. A German artist’s unique instrument designs forge a new sound world. With an all-analogue signal path and total recall courtesy of digital control, this EQ promises a lot. Does it deliver? Paul White checks out this stomp-box effect from Electro Harmonix. Paul White puts these guitar pickups from Kinman through their paces. The StudioLive range of mixer interfaces now includes a compact 16-channel model.We find out how well it performs on the road. We examine the Swedish soft-synth specialists’ first foray into the world of hardware: the Balance. PSP’s latest equaliser seeks to combine analogue smoothness with digital precision. SE Electronics have enlisted the help of renowned acoustician Andy Munro to design these striking studio monitors. Does their unique approach to speaker design pay off in the real world? Sony’s MDR range of closed‑back cans has been popular in studios for years, and now includes a new flagship model. Soundhack’s powerful algorithms can provide high‑quality pitch‑shifting — or sonic mayhem! The concept behind TK’s BC1 is simple: take a classic bus-compressor design and improve on it. Having already given us a virtual studio multitrack tape recorder, the boffins at Universal Audio turn their attention to mastering machines. Yamaha’s MOX range offers unusually tight integration with your DAW. Is this the way forward for synthesizer workstations? Hugh Robjohns checks out this new speaker stand from Zaor. We demonstrate that there’s more to Live’s Grain Delay than bizarre effects. Save time and protect yourself from RSI by learning to edit audio in Pro Tools from the QWERTY keyboard. Mastering keyboard shortcuts makes Cubase easier to use and is good for your health! Get up and running with MOTU’s MachFive 3, an ideal software sampler partner for Digital Performer. We aim for more punch, depth and clarity in a quirky urban track. Have some phase‑switching fun in Sonar X1! We continue our exploration of the new features and functions in Reason 6. Optimising vocal recordings and tackling some troublesome mixes are on the agenda this month, as the SOS team travel to Paul Shepherd’s studio in Nottingham. Drew Bang: Is the customer really always right? Read more about Drew Bang: Is the customer really always right? The multitracks for Evanescence’s third album were so big that they required two maxed-out Pro Tools rigs to play back! Ed Sheeran’s phenomenal success depended on hard work, a few lucky breaks, and the talents of long‑term co‑writer and producer Jake Gosling. With expected component shortages and the consequent rise in hard‑drive prices, what can the PC musician expect from 2012? Read more about Q. Can you help me with MP3 file conversion? Read more about Q. Could I use Cubase System Link to slave my VST plug-ins? Q. Do mixes benefit from low-pass filtering at mixdown? Read more about Q. Do mixes benefit from low-pass filtering at mixdown? Q. How can I create a 'fake' M/S setup that is mono compatible? Read more about Q. How can I create a 'fake' M/S setup that is mono compatible? Q. Is the quality of S/PDIF connections on soundcards variable? Read more about Q. Is the quality of S/PDIF connections on soundcards variable? We all have musical skeletons in our closets, but at least media composers don’t have to wheel them out every night at Wembley Arena. Economic uncertainty and the rise of digital distribution have taken their toll on many major studios, but there is still a future for them. Media content for the January 2012 issue.